Taking the Japanese airport was one of the first objectives for the Americans in the Battle of Saipan. There are still several Japanese buildings remaining including the Airport Bunkers. 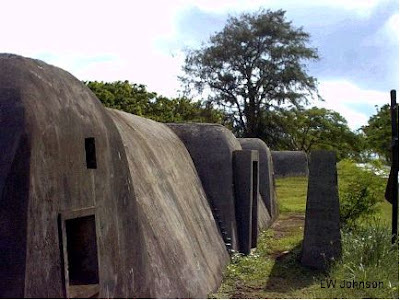 These bunkers saw a lot of action. There is a large hole in the side of each bunker from direct hits by the American tanks. The old Japanese hardstands are now a soccer field. Tank blast hole in each bunker. Unknown Japanese pre-war building near the airport bunkers. Could possibly have been a 1930's police station.